At the height of her career as a successful realtor, Nadia had everything she wanted: money, a beautiful home, a career she loved, and a full social life. All that changed at a friend's baby shower when her friends indicated Nadia's life was lacking quality and substance and she had little in common with them. The statement was an eye opener for Nadia. Nadia's biological clock immediately began ticking. She was so focused on having a child that she engaged in a one-night-stand with the wrong man. Realizing her mistake almost immediately she attempted to pin the pregnancy on a man with more winning qualities as a family man. While her plan for an instant family worked out, it left Nadia wanting. Finding life with laid-back husband Keith Holmes unfulfilling, career-driven Nadia returned to work. She soon developed a relationship with her client, Mark. The chemical attraction was so strong that, around him Nadia felt like an animal in heat. That attraction crashed - literally - when Nadia engaged in a steamy sexual scene while on the way to show a property - with her baby in the back seat! The results were catastrophic for Mark, Nadia, and baby Maya. 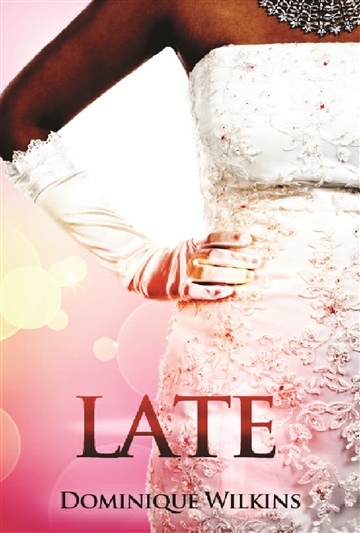 Late is a fast-paced tale of love, loss, betrayal, and second chances. It cautions the listener to be careful what you wish for and not to fall into becoming what others think you should be. Dominique is also a licensed cosmetologist, a divorced parent, the founder of the annual CAPS Expo (Christian Authors Promoting Success) and a chapter president for Authors Promoting Success. She was born and raised on the South side of Chicago, where the crime and murder rate ranks one of the highest in the U.S. It is because of this exposure, that she writes short stories to encourage fellow broken readers through their own situation and provide them with relevant resources to keep them going and prayerfully a desire to implement changes. They are relatable stories about bad parents, jealous neighbors, fake friends, cheaters, displaced love, pain and other sinners who inspire change or provide a life lesson. The stories are all written with biblical scriptures intermingled for the reader to refer directly to The Bible for more healing. **PLEASE BE AWARE THAT BECAUSE THEY TARGET PEOPLE WHO ARE LIVING RATED-R LIVES, THE STORIES MAY INCLUDE SOME RATED-R MATERIAL**Though they are faith based; they do not require any prior knowledge or understanding of The Bible to enjoy it. If the reader is not yet ready to embrace the included scriptures, the storyline will still captivate you and a personal encouraging message from the author will still await you at the end! [As a disclaimer, I was sent the text by the author because I'm narrating the audiobook... But this review is very, very sincere. ]I was not supposed to read this entire book all the way through, as I was only asked to provide the narration for the first four chapters-- initially. But leave it to me to get carried away while reading the story.. I ended up recording the entire book because I couldn't stop reading!I had told the author... "If I had been watching this as a show-- I'd have been one of those women who screams at the television while clutching her sofa cushion. I can't wait to read more! "Her writing style is very accessible, as is the content matter. Truth be told, I'm not a big fan of Christian fiction because it's generally not a genre I can relate to. The stories I'd read before tend to leave me feeling like an awful person in comparison to these over-the-top "Miss Priss" type characters. It's not a feeling I enjoy.But the main character in this book, Nadia... You can completely relate to her. You admire her, envy her, hate her, worry for her... You can't help but be pulled in to the story!Kudos to Ms. Wilkins on an excellent book and I can't wait to read more!